Yay to my favorite! The world’s most beloved ice cream brand introduces Pistachio Almond as its Flavor of the Month. This famous flavor, launched in the 1960s, is a rich pistachio ice cream loaded with roasted almonds. If you can’t get enough of Pistachio Almond ice cream, try it as a milkshake or a sundae for a variation. You can also take home this classic flavor and share it with your loved ones in a pint, quart or half gallon. 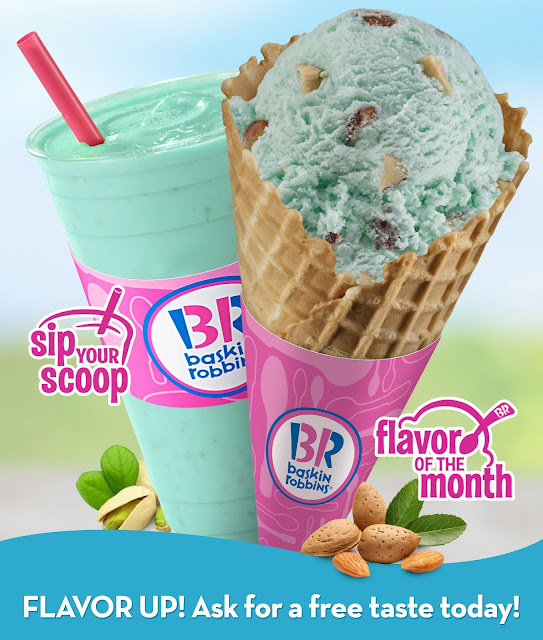 To complement the rich flavor of pistachio, get a scoop of Baskin-Robbins Green Tea ice cream for a harmonious blend. For every regular double scoop sold, Baskin-Robbins will be donating P31 to Operation Smile to provide free reconstructive surgery to children with cleft lip/palate through the BR 31 Smiles Project. Visit Baskin-Robbins shops at the Central Square, Bonifacio Global City; Greenbelt 5 and Glorietta 5 in Makati; Fairview Terraces and Trinoma Mall in Quezon City. For more details about Baskin-Robbins, visit www.baskinrobbins.ph or check out their Facebook (facebook.com/baskinrobbinsph), Twitter and Instagram (baskinrobbinsph) accounts.